In life we make choices, but you don't choose your club, it chooses you. To advertise the Irish regional rugby team Munster's latest 2014/15 away kit, the Mill's studio team collaborated closely with Intermarketing Agency to create this powerful and patriotic spot, featuring members of the team sporting their striking solar green attire. We see the players take form, coming together in a surreal digital mass of letters and words, representing the notion that every previous and current player, as well as every fan plays their part in the team. Head of motion design Nils Kloth comments, "This was a fantastic and interesting idea from Intermarketing Agency to sink our teeth into. Our challenge was to create the typography particles which would eventually come together to create each player, we then needed to establish how each particle would move, interact and set themselves into the players' skin, jersey and chest. In order to do this we took 3D scans of body tracking completed on the shoot, enabling us to track the geometry of each players' actions. 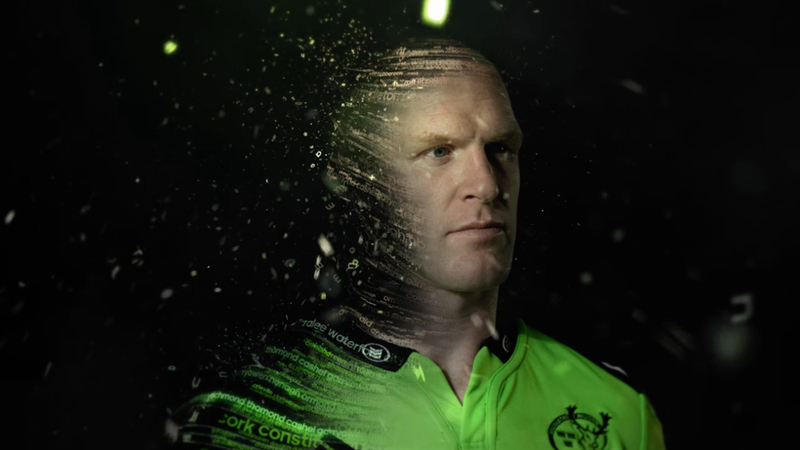 We then used Cinema4D to create the textures and particles before comping the piece together in AFX and polishing it with a grade by Mick Vincent, who worked to bring out the unique Munster jersey colour." The campaign is accompanied by the hashtag #allmunster.